PartNErship is an initiative by Country Club Christian Church to focus on developing relationships in the Northeast Kansas City community and working collaboratively to make an impact. PartNErship targets the Independence Avenue corridor near Benton Boulevard. Through agencies working in that area, we have an opportunity for meaningful service. The Northeast is a microcosm of God’s peoples and a model of diversity. Approximately 30,000 residents live there, representing about 40-50 different countries. Many community services are offered in this area, but it continues to struggle with urban issues like blight, homelessness, school drop outs, hunger, and unemployment. Our church also shares a historical link to the NE area because our founding pastor, Dr. George Hamilton Combs, was once the pastor at Independence Boulevard Christian Church, and we also enjoy a longstanding connection through Micah Ministry there. We have several ongoing projects in the Northeast. Speak to one of the champions listed for each opportunity for more information on how you can get involved or fill out the form below or call our church office at 816-333-4917 to be contacted. Della Lamb Community Services – Della Lamb focuses on empowering low-income clients to meet the challenges of education, employment and self-sufficiency. Over 50 percent of Della Lamb’s clients are refugees from around the world. PartNErship Service Opportunities include helping adults learn English as a Second Language, morning or evening and also setting up and making homes ready for new refugees resettling in the Northeast. Grace United Community Ministries – The mission of Grace United Community Ministries is to work hand in hand with families and individuals in the Northeast community to address their basic physical, educational, and spiritual needs so as to empower them to break the cycle of poverty and live a purposeful life. Sheffield Place – The mission of Sheffield Place is to empower homeless mothers and their children to heal from their trauma and help them become self-sufficient. Sheffield Place has assisted than 750 families in making the difficult journey from homelessness to self-sufficiency, believing that the mental health needs of the homeless mothers and children must be addressed to help children and families heal from their trauma. Service opportunities for families, groups and individuals include, adult interaction with children 3-12, playing with games, reading one-on-one or as a group, snacks and art projects. Saturday morning from 9:00 a.m.-noon. Training provided. Adult assistance in direct care for infants helping them with developmental tasks. Training provided. Saturday evening dinners – a monthly dinner from 5:00 p.m. -7:00 p.m. that provides food, beverages and tableware for 12-14 adults and 15-20 children. Volunteers serve the food and interact with the families. Other opportunities arise as needed. Jerusalem Farm – Jerusalem Farm is a Catholic intentional community at 5th and Garfield Streets. Built on the four cornerstones of Prayer, Community, Service and Simplicity, Jerusalem Farm strives to transform lives through service retreat experiences, sustainable living and home repair. The mission of Jerusalem Farm is to be available to the needs of the community by addressing home repair needs and coordinating volunteers from Kansas City and around the country. Service Opportunities are available for families, groups and individuals of all ages and levels of commitment. These include home repair and garden work daily throughout the week and community nights at Jerusalem Farm every second Tuesday when all friends and neighbors are invited to share a meal and good conversation. All opportunities include working hand-in-hand with our NE neighbors. 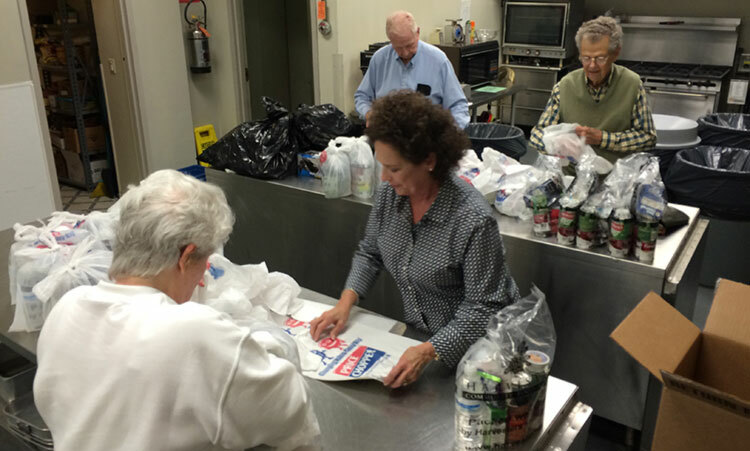 Micah Ministry: Country Club Christian Church serves dinner at Independence Boulevard Christian Church’s Micah Ministry, 606 Gladstone Avenue, each month, providing free, nourishing suppers to our neighbors in need. Children age 11 and older are welcome when accompanied by an adult. Second Monday of each month at 5:00 p.m. We also collect and sort donated clothing and hygiene products for Micah’s guests.